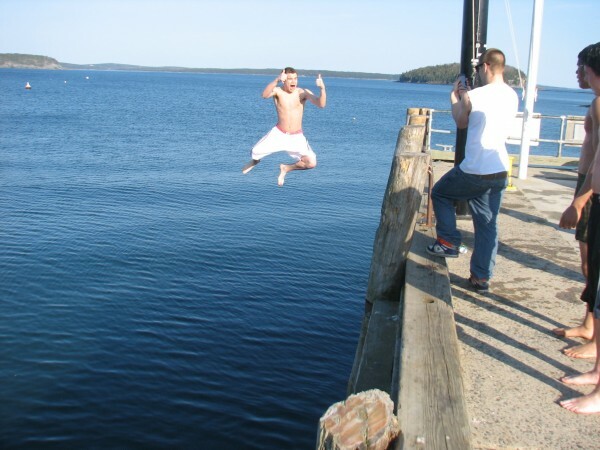 Dakota Stewart of Bar Harbor mugs for the camera as a friend takes a picture of him jumping into the water off the Bar Harbor municipal pier on Thursday, March 22, 2012. Stewart and four other boys, all students at Mount Desert Island High School, took turns jumping off the pier and then scrambling back up a ladder. Bar Harbor residents Jalique Keene and Teagan Candage, both students at Mount Desert Island High School, mug for the camera on Thursday, March 22, 2012, as they jump into the harbor off the Bar Harbor municipal pier. According to the National Oceanic and Atmospheric Administration, temperatures in Bar Harbor have been in the high 70s the past two days, which is unusually high for this time of year. Ocean temperatures, however, have been around 40 degrees. “It’s cold!” the boys said when they climbed out.